I just can't skate on them. Is it me? Is it my wheels? It's really annoying. If it's new level slabs then I'm fine, but the old ones with dips and bumps all over the place I find so difficult and slow me down to almost a walk. I went to a new park today. I struggled and stumbled all the way there and back. At the park I was flying around perfectly but I have no intention to stay in the parks, only using them for practice at the minute. What to do? Go to the rink and dance your.........uh.....toes into a wild frenzie. Lol I'm not really one for rink skating. All those people and all those left turns (assuming your going in that direction!) I love the freedom of just going wherever or going where I need to go but on my skates. Or just getting out if I'm bored. I NEED to skate the streets. It depends how bad the sidewalks are. Bigger wheels definitely help, and softer ones help to an extent. A longer wheelbase or placing the wheels around your center of balance helps. Also, going faster helps. Thing is, I don't know that a bigger wheels would fit? The wheel nut is right to the end on the wjeels i have kn now. I wonder if thats because theyre not hubbed? Would that make a difference? Everywhere else absolutely fine with these wheels. Going faster I did wonder about but I find it so much effort. I wonder if it's a matter of building up strength also. I'm only Little and its hard lol. By bigger I mean taller, which is different from wider. However, there is a maximum size that will fit. When you turn the suspension allows the boot to tilt while the wheels remain on the ground. If your wheels are too big and you tilt to much you get "boot bite" because your boot will rub against the wheels. Those are pretty big wheels. You might be able to fit something bigger. I'd try going faster first. If you have enough momentum your wheels don't dip into cracks and stop. You can also look ahead and step over the more problematic areas. It's counter-intuitive, but WJCIV's right, a little bit more speed can sometimes help. The other big thing to remember is: soft knees, hips, and core! You want to use your whole body as a shock compressor. If you try to rely on just your skates and ankles, the rest of your body will get thrown around for sure. With regards to problems building momentum, I wonder about how freely your wheels spin. If you pick up a skate in your hand and spin a wheel, how long does it go? If you aren't using greased bearings they should spin for tens of seconds easily. With hubless wheels spacers are advisable, but those ones are big enough that I don't know they would be required. Loosened the wheels and went out quickly. It certainly has made some difference. I found it that bit easier to skate on the rougher parts and pavements. But.... lol.. I still feel I'm making too much effort or again maybe it's just where my legs need to build up a resistance. Curious as to whether taking this washer off will help at all. They spin for 5 seconds. If I loosen them they rattle slightly also the wheel nut would be closer to the end than already is. I little bit of free play is just fine. The trick is to tighten the nuts to give as little free play as possible without slowing down the bearings at all. If you look closely as the nut you will see there is a little nylon ring. This ring must be entirely on the axle. It's preferably if the rest of the nut is as well, but you may be able to get away with a little less. I've been known to flip nuts around and put the nylon side on first in certain circumstances, but others will tell you that's a bad idea. The washer may or may not be necessary. It depends on your trucks. Bearings are lubed with grease (solid) or oil (liquid). Grease slows down a bearing during the free spin test - when you spin a wheel/bearing with no weight on it. However, once you add pressure/heat there is very little difference. Thank you. Ok. So the nuts as they are in my pic are fine? They are more or less the same since loosen as I only had to loosen not even half a turn or about that at most. They feel alot more "rolly" Lol under my feet now but I guess that's the idea right? Is there any way of posting a video on here? Maybe if I could show you instead of you reading it. 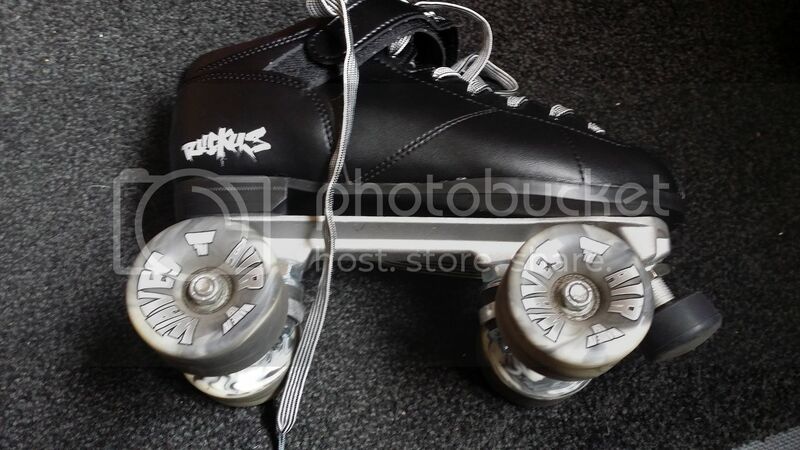 I feel like a total pain with all these questions but I need my skates to be right and know no-one that knows a thing about them.